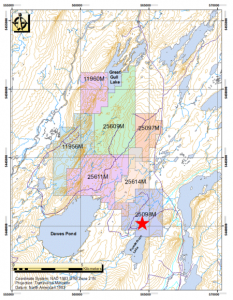 Montreal, Quebec, August 15, 2018 – Champion Iron Limited (TSX: CIA, ASX:CIA) reports that its wholly-owned subsidiary Champion Iron Mines Limited (the “Company” or “Champion”) is pleased to disclose results of recent exploration drilling at its Powderhorn property, located in North Central Newfoundland, 40 km southwest of the town of Springdale. 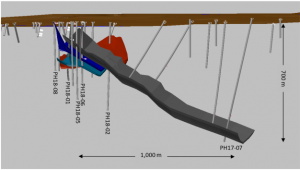 This program intersected several zinc (“Zn”) rich intervals, including drill hole PH18-01 which intersected 3.31% Zn, 0.53% copper (“Cu”) and 48 g/t silver (“Ag”) over 4.45 meters, 5.2% Zn, 0.48% Cu and 22 g/t Ag over 4.46 meters and 1.18% Cu over 0.69 meter. Drill hole PH18-06, located 100 meters away, intersected 6.94% Zn and 48 g/t Ag over 3.35m, including a 1-meter width which returned 16.4% Zn. The 3,500 meters drilled during spring 2018 cross-cut one or several Zn-rich layers (table 1). Table 1: Significant intervals drilled during the 2017-2018 exploration of the Powderhorn property. Reported widths are core length and core angle is approximately 70 degrees, meaning that reported widths are approximately 1.07 times larger than true width. Except for PH18-01, all holes are vertical which means that from and to can be used as real depth. A 2% Zn cu-off was used for outer limits of the reported intervals. Any samples, regardless of their grade, occurring within the listed intervals are included in the intervals grade calculation. Assaying was done at Eastern Analytical in Springdale, NL. The Powderhorn project targets the same volcanic units that host the Buchans Mine, located 60 km away, one of the richest volcanogenic massive sulphide deposits ever discovered. 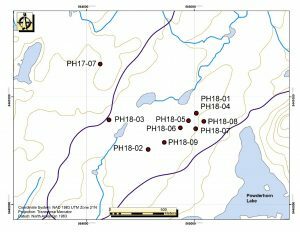 Geological data acquired by Champion in 2017 and 2018 strongly suggests that the Zn-rich layer discovered near surface in PH18-08 is continuous and is likely linked to one of the layers intersected in PH17-07, located 1 km to the northwest. Figure 1: Location of the 2017-2018 drill holes. The red area represents the target area based on 2017-2018 drilling and two historical holes (not shown). 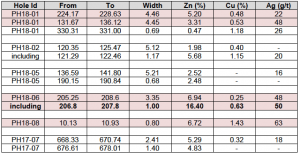 Although PH18-03 is not listed in table 1, there is a 1 meter long 4.45% Zn interval that suggest that the zinc-rich layer may extend to that area. Table 2: Holes drilled between December 2017 and May 2018. DDH: Diamond Drill Hole. Location in Universal Transverse Mercator (UTM) NAD83 projection, Zone 21N. A preliminary geological model (figure 2) suggests the occurrence of three Zn-rich zones (grey, blue and green) on top of a Cu-rich zone (red). At this point it is not defined if the zones are linked or if they are stacked lenses or layers. A 12,000-meter drilling program scheduled to commence in the fall of 2018 is designed to test and add geological data and details to the shallow zone (e.g. the potential link between the different Zn-rich zones and the distribution of the copper mineralization) and confirm the presence of continuity of the zinc mineralization between PH18-01 and PH17-07. Except in the south direction where PH18-02 and PH18-09 did not intersect any mineralization, the target area is open in all directions and therefore there is potential to add significant volume of massive and semi-massive sulphide to the project. The Powderhorn project is located in North Central Newfoundland, 40 km southwest of the town of Springdale, 15 km north of the community of Badger and 3 km away from the Trans-Canada Highway. The property is comprised of 7 exploration licences covering 63 km2 (figure 3). Figure 2: Powderhorn Preliminary Geological Model showing the location of all the holes drilled in the area. Holes listed in table 1 are identified. Discovery of sulphides in the area date back to 1940 but it appears that those were related to sediment-hosted pyrite and pyrrhotite. Zinc mineralization was found later along the shore of Powderhorn Lake and in a boulder located along a logging road. Although the property has been owned by several companies, exploration to date has resulted in limited drilling (less than 12,000 meters). Champion’s exploration strategy at Powderhorn has been to identify geophysical anomalies underneath the sedimentary rocks that overly the mineralization-bearing felsic volcanic rocks. Drilling these anomalies was done in 2017. The geology at Powderhorn is similar to the one at Bucchans which produced more than 16 Mt at 14.5% Zn (Kirkham, 1987. In Geological Survey of Canada Paper 86-24), but also to several deposits of the Bathurst Mining Camp. Geological and electromagnetic data suggest that mineralized layers at Powderhorn are undulating with an overall dip toward the northwest. Figure 3: Champion Iron Mines Limited Powderhorn tenements in Newfoundland, Canada. Red star indicates the location of the Powderhorn discovery. In accordance with National Instrument 43-101, Dr. Hugues Longuépée, P.Geo. is the Qualified Person responsible for the technical data reported in this press release. He is a Professional Geologist registered in Québec and in Newfoundland and Labrador. He is the Geology Manager at Champion Iron Mines Limited. He has visited the core logging facilities on several occasions and validated the data (QAQC).